After the successful launch of the new, lighter Nikon 300mm f/4E lens, Nikon has continued its drive to lighten up its long prime lenses with advanced technology. It has introduced weight-reduced versions of two of its most popular long lenses. The new Nikon 500mm f/4E is 2 lbs. 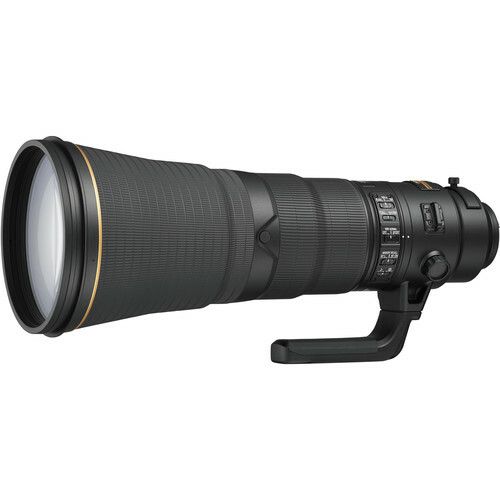 lighter than its predecessor at 6.5 lbs., and the new Nikon 600mm f/4E is a remarkable 3 lbs. lighter than the previous version, at 8.2 pounds…. Both lenses feature plenty of lens tech (full list below), including fluourite elements, nano coatings, internal focus, and the expected VR, AF-S, and M/A features. One interesting update is the addition of a Sport and a Tripod mode to the VR system. Neither lens comes cheap, with the Nikon 600mm f/4E selling for $12,300 and the Nikon 500mm f/4E going for $10,300 – roughly $1,000 per pound of weight savings if you’re keeping score that way. Both are available for pre-order at B&H and expected to ship in two weeks – on July 16. Unfortunately, they’re a bit late for me to field test on my upcoming Alaska bear safaris, but I look forward to doing a review of one or both later this summer. Optimized for fast shooting speeds and working in difficult conditions, the AF-S NIKKOR 500mm f/4E FL ED VR is an impressive telephoto designed for Nikon FX-format DSLRs. The sophisticated optical design incorporates fluorite and extra-low dispersion elements to control chromatic aberrations and distortions, as well as lessen the overall weight of the lens. Also contributing to improved image quality, both Nano Crystal and Super Integrated Coatings have been applied to lens elements to lessen flare and ghosting for improved contrast, clarity, and color fidelity. Protecting the advanced optical design is a front fluorine-coated meniscus glass element that, when paired with the weather-resistant magnesium alloy barrel, supports working in inclement conditions. Designed for use with FX image sensors, this lens is also compatible with DX sensors where it will provide a 750mm equivalent focal length. Fluorite and ED lens elements work to reduce chromatic aberrations; improve overall image sharpness, clarity, and color fidelity; and help to minimize the overall weight of the lens. Vibration Reduction image stabilization helps to reduce the appearance of camera shake for up to four shutter speed stops, benefiting this lens' use in low-light conditions. Additionally, a designated Sport Mode is well-suited to working in fast-paced conditions and a Tripod Mode helps to suppress subtle ground vibrations when working atop a support system. A removable monopod collar is included with the lens for well-balanced support when working from a monopod or tripod. The collar ring also incorporates ball bearings for smooth transitions between horizontal and vertical shooting orientations. 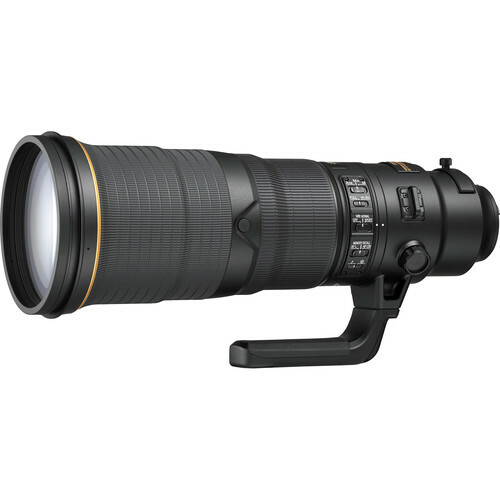 A long-reaching telephoto optimized for sports, wildlife, and nature shooting, the Nikon AF-S NIKKOR 600mm f/4E FL ED VR Lens features an advanced optical design that both lessens the overall weight of the lens as well as contributes to improved image quality. The fluorite and extra-low dispersion elements reduce chromatic aberrations throughout the aperture range while Nano Crystal and Super Integrated Coatings help to suppress flare and ghosting for greater contrast and clarity. Complementing the image-enhancing attributes, the lens also incorporates a front fluorine-coated meniscus glass element that, when paired with the weather-resistant magnesium alloy barrel, supports working in inclement conditions. Benefitting working in fast-paced conditions, as well as in low-light situations, Vibration Reduction image stabilization compensates for the appearance of camera shake by up to four stops, and dedicated Sport and Tripod Modes help to produce sharper imagery for specific shooting applications. A Silent Wave Motor AF system produces fast, near-silent focusing performance that suits both stills shooting and movie recording which can instantly be manually overridden by simply turning the manual focus ring. Additionally, an electromagnetic aperture mechanism is integrated into the lens design to provide greater exposure control stability that is especially beneficial when working with faster continuous shooting rates. Designed for use with FX image sensors, this lens is also compatible with DX sensors where it will provide a 900mm equivalent focal length.